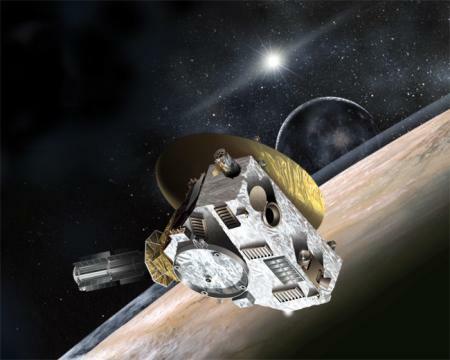 Artist's impression of NASA's New Horizons probe passing Pluto (with Pluto's moon Charon in the background) in 2015. Image credit: Johns Hopkins University Applied Physics Laboratory/Southwest Research Institute. This page is in response to some questions from educators and others on how to handle the recent demotion of Pluto from planet status. Why is there debate about whether Pluto is a planet? For decades after Pluto was discovered in 1930, it was thought to be at least the size of Mercury or even the Earth. For a long time it was easy to distinguish between the nine planets and the thousands of much smaller asteroids and comets in our solar system. In 1978 Pluto's moon was discovered, helping to show that Pluto is smaller than the Earth's Moon. Since 1992, astronomers have discovered a large population of icy bodies past Neptune, a few of which are comparable to Pluto in size. This, along with the recent discovery of planets orbiting other stars, have now made it important for astronomers to clarify the term "planet". The current issue is not about the characteristics of Pluto: astronomers have clear evidence (on which they agree) that Pluto is an icy body about 2,400 km (1,500 miles) in diameter, likely with a rock core, and that it is one of thousands of icy bodies orbiting beyond Neptune, with a few of these bodies about the size of Pluto. Rather, the issue is about the definition of the term "planet". Scientists (as do the rest of us) use such terms to classify objects, to organize them by important characteristics. Scientists prefer to be more precise in defining these terms, since they want to be clear on what their words convey. Such classifying terms can be subjective, though, when dealing with a continuous range of characteristics. What is the difference between a small continent and a large island? There is no fundamental difference, but it is convenient to use a break in size between Australia and Greenland. This is similar to the distinction between planets and smaller objects. Another issue is that classifying objects by important characteristics depends on what characteristics are important, and astronomers may disagree on what characteristics are the most important. What is this new definition of a planet? The International Astronomical Union is a worldwide organization of astronomers. Astronomers have entrusted several duties to this group, including decisions on names of solar system objects. On 24 August 2006 the IAU adopted a definition of the term "planet" which basically says a planet is an object orbiting the Sun, is large enough for its own gravity to form it into a sphere (more or less), and has cleared the neighborhood around its orbit of other objects. This is most authoritative word as far as astronomers are concerned, but might not be the final word. Before the new definition of a planet was adopted, Pluto was defined as a planet by the IAU (they in fact noted this in a statement on 3 February 1999). The key test will be whether astronomers (and others) actually use this new definition. Many have accepted it, but some have not. A group of planetary astronomers has rejected the new definition and plans to meet in 2007 to formulate a better definition. The "dwarf planet" definition might not catch on. In addition, the new IAU definition is specific to our solar system, but may be hard to apply in other planetary systems. The definition may need to be clarified in the future; in any case, time will tell if this definition is accepted by astronomers. So how many planets are there in the solar system? Using the new IAU definition, there are eight planets in the solar system. Pluto as well as Eris, the recently discovered trans-Neptunian object slightly larger than Pluto, are counted as dwarf planets (along with Ceres, the largest asteroid). Some teachers may find it convenient to teach an eight planet solar system, given that many educational publishers are adopting the new IAU definition despite some lingering debate among astronomers. I'll admit I have issues with the new definition, and given that many planetary astronomers are rejecting the new definition, there may be some benefit to acknowledging that Pluto and Eris (at a minimum) are transitional objects that some would count as planets. Regardless, this should not become a point of confusion: Pluto and Eris are the largest of these trans-Neptunian icy bodies, no matter what other category we put them in. How do we teach about planets, then? One may find the new definition is actually helpful in teaching: this is a more clear definition of the term "planet" than has been generally used before. But also keep in mind that this is a label. Pluto is the same object it was in 2005; whether we call it a planet or not doesn't change this. A lesson here is that intermediate objects can be hard to classify. Recognize that Pluto is a transitional object. It is one of this newly discovered class of icy objects past Neptune. It is also one of a handful that are large enough to share properties with the eight major planets: Pluto is spherical because of its own gravity, it is probably differentiated (with a central rocky core and a thick layer of ice on top), it has an atmosphere and a family of moons. Recognize that the objects in the solar system don't always fit into nice simple categories. Many teachers are accustomed to teaching that the asteroids are small rocky bodies orbiting between Mars and Jupiter. But many asteroids are found outside the "asteroid belt": thousands are known to approach the orbit of the Earth and thousands are known to share Jupiter's orbit. In the same way, Pluto is hard to categorize. This lack of simplicity is itself interesting: the more we learn about the solar system, the more it defies our expectations, showing great and facinating variety. Note that science is always changing. It is not a set of facts we might look up in a dusty book; it is our understanding of the world around us, and we are always making changes to our understanding as we discover more or recognize that we had the wrong understanding before. Science is limited because our knowledge is limited, and sometimes our own assumptions produce limits; at the frontiers of science there may be intense debates among scientists. But science is flexible, and has served us well in part because it submits itself to examination and review resulting in improvement. Recognize the interesting history here. Astronomers called Pluto a planet from 1930 until recently. Astronomers are human too, and they have been arguing this issue for years before this decision, and they are still arguing about it. But they still work together to learn about Pluto and our solar system, and they're looking forward to 2015 when the first space probe will visit Pluto. This headline-grabbing debate has captured the attention of many students, and teachers can build on this to increase interest in astronomy in particular and science in general. Standardized testing and objectives should recognize that science is an evolving understanding of the world around us, and that definitions that involve classifying objects are merely labels used to organize thinking--but not straightjackets on our understanding. It would be appropriate for testing not to penalize students for any lack of understanding on the status of Pluto when the scientific community and society at large have yet to settle to a particular understanding. This is recognized, for example, in Texas: while a few years ago some curriculum material from the Texas Education Agency stated we will teach "a nine planet solar system", after the IAU vote the TEA stated that teachers should teach the most current science without fear regarding testing, as no questions involving the status of Pluto will appear in the next round of standardized tests. Last modified 16 September 2006.